I was excited when I bought this boat from a guy this winter, knowing that when I bought it, it had a very large dent on the front left with some cracks and leaks in it. So right off the bat I knew it would be a good cheap project boat. 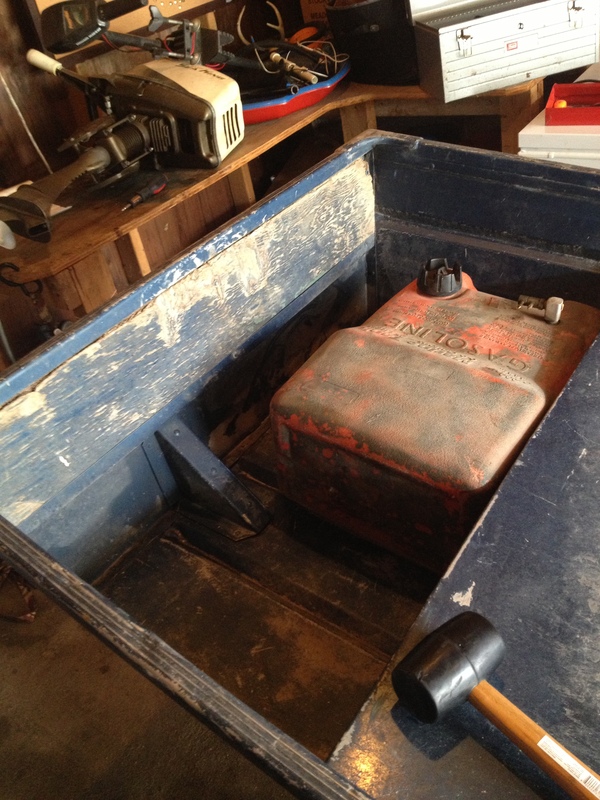 The boat was a 14ft Jon Boat, it had a trailer and also a 7hp engine. I started by working on the boat itself. Inspecting the boat there were a lot of very noticeably bad rivets that were leaking as well as the large dent in the front. Also the wood brace board on the back was rotten and the paint/protection was very worn. 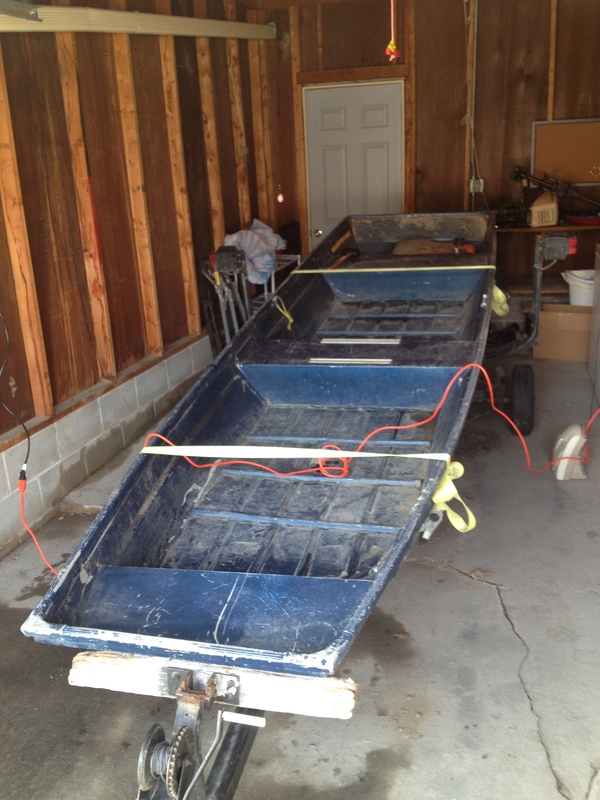 Here are some pictures of the boat before I started the project. I started by removing all of the rivets that were questionable. I took a power drill with a bit that was about the same size as the rivets I would be removing. I proceeded to drill out any rivet that was not holding sturdy in place. At this point I also removed the rotten board on the back, then spray washed the entire boat so there wouldn’t be any dust or particles clinging to it while I was working. 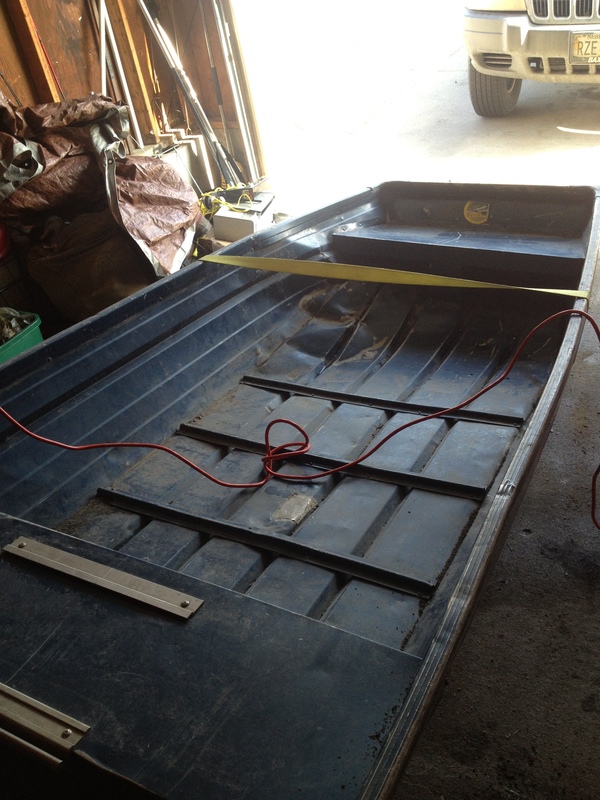 Below is a picture of the boat at this stage. Once this was completed I had a choice to make, I could use rivets again to reseal the holes or I could grab bolts with lock nuts. I knew the rivets would hold nicely and match the rest of the boat but some of the holes were forming small cracks near them that would not be covered by a simple rivet, so I elected to use the bolts with lock nuts with larger washers to cover the areas that were cracking or needed reinforcements. After replacing all of the worn out rivets I had to replace the wood brace on the back of the boat, I went to Menards and grabbed a weather treated 5ft board and cut it down to size, attaching it to the back as well with bolts, washers and lock nuts. Know that the boat was back intact it was time to work on the dent in the front. I DO NOT know how to weld aluminum and was not looking to spend a great deal of money on the boat since I had picked it up for $300. After discussing my options with my Uncle who has welding experience and my Dad who is a very smart do-it-yourself repair guy at his house, they both suggested an item I had not worked with before called Epoxy Putty. Following the instructions on the package I sanded the surface to create an area for the material to grab a hold of, then applied the putty. 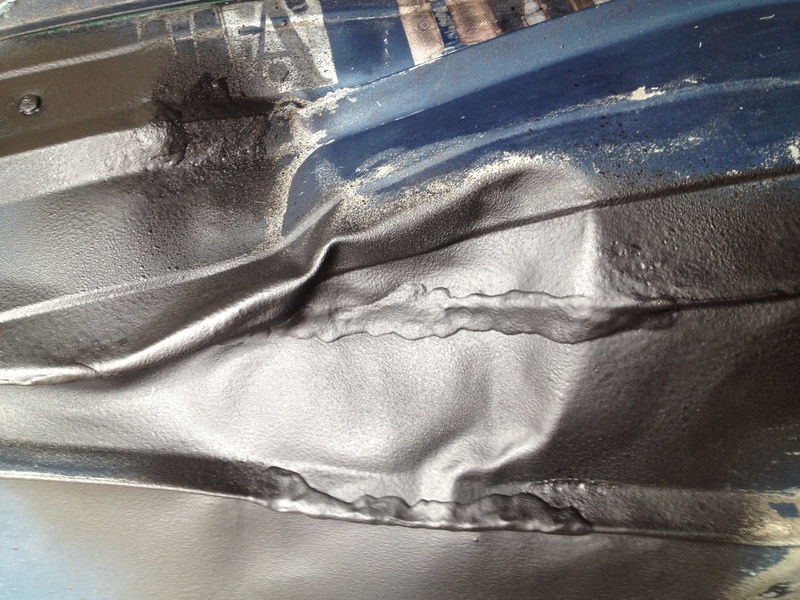 Within 30 minutes it had hardened and stuck to the surface better than I had expected and in fact worked so well I decided to cover the rivets on the boat with it so that there was no chance for small leaks. I had also heard of the product called Rubber Seal, which is a rubber spray that is designed to seal any water or air leaks on surfaces such as this. On their commercial they even did an experiment with an aluminum jon boat like mine, so I was sold. I covered all of the areas that I had put the putty on so that if there was any small leaks left they would now be sealed. A little redundant… yes but I wasn’t going to take any chances with leaks when I put it on the water. Also the total cost of the two items was very small. 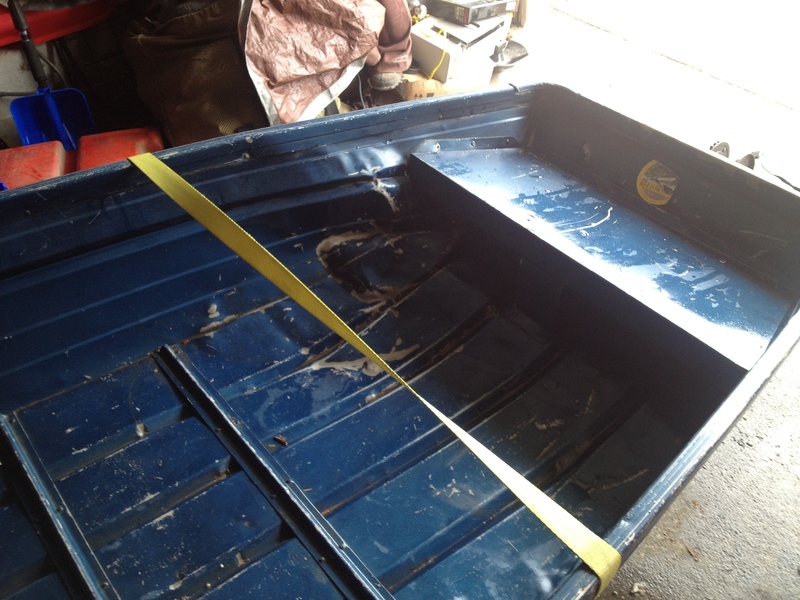 Below are some pictures of the bottom of the boat and the dent to show how it was sealed. The trailer also needed work done, I apologize I do not have before and after pictures of the work done here. 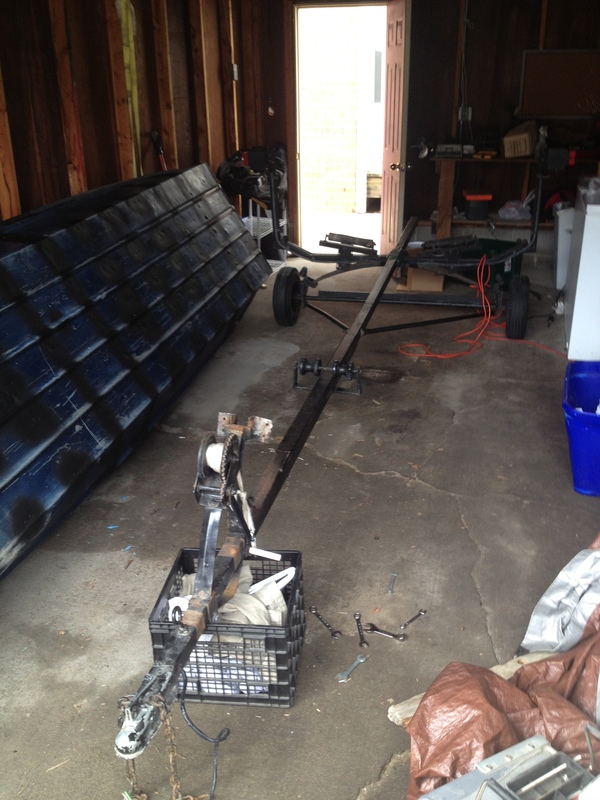 What I had to do was, replace the front brace board for the bow of the boat, put new rods through the rollers on the bottom to hold them in place, and put a cushion board on the back so that the end of the trailer would not have sharp edges that could puncture the boat. I had also replace the chains in the front, and fixed some minor issues with the wench. It also had many years worth of stickers and other material stuck to the surface so I picked up a wire brush attachment for my drill and went to town scrapping off this old material. It was a long process but worked much better than scrapping it off by hand. To complete the work being done on the boat I had to make it look nice. 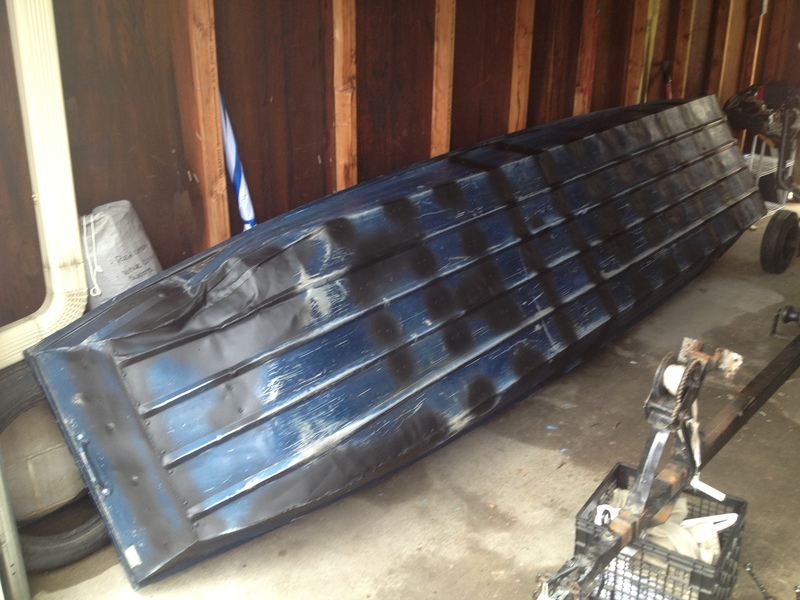 So I grabbed a few cans of rustoleum spray paint, black with a slightly glossy finish and covered the boat with two layers of paint. Here is a picture during this process. I had already owned a trolling motor and some clamp on swivel chairs. 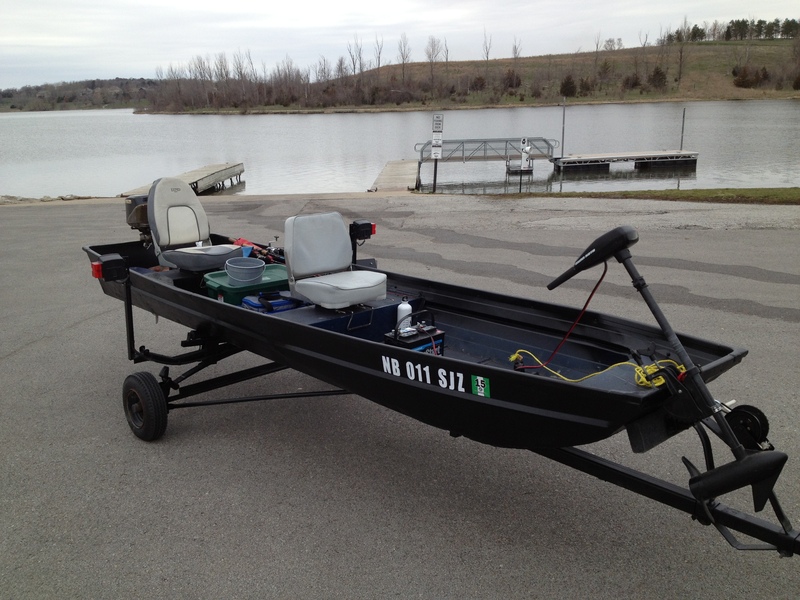 And with those additions plus the boat registration it was ready to hit the water. The engine still has its issues but I am attempting to get those fixed so it will be smooth sailing. 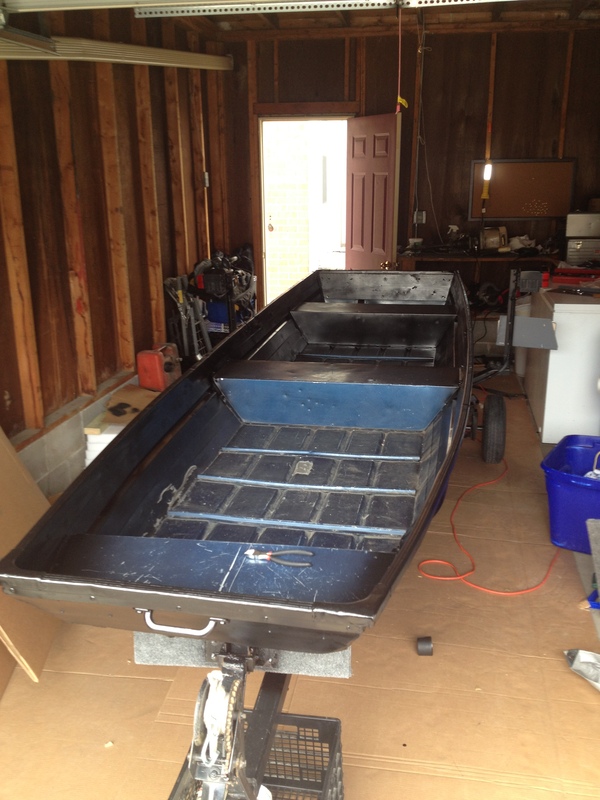 Below are the pictures of the finished boat project. 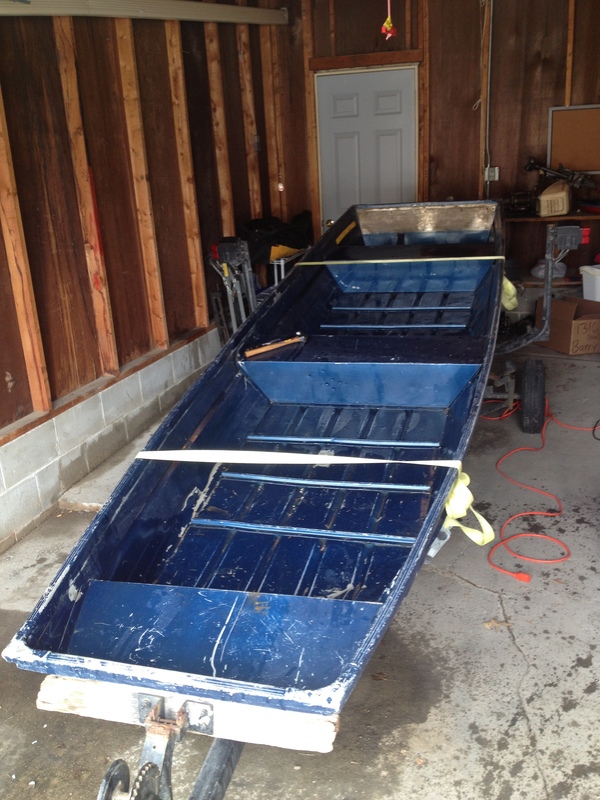 I have taken the boat out multiple times this spring and it seems to be sturdy and leak free! I am happy with the suggestions I received and the work done. I hope you and enjoyed reading through this and as always, if you have any questions or comments please let me know!